So I knit nothing Thursday evening--(and had nothing to blog about Friday) Plus, I went Friday for an eye exam—just routine stuff (or so I thought!) I've worn glass going of forever, (since I was 15) and well time takes it toll, and I need to get my eyes checked, and new glasses ever few years. This exam was, by far the most complete ever. My vision were tested (good old eye chart, and not much of change), and my eyes examined every way possible! I had drops (that left me with yellow rings around my eyes), a manual scan, and the new light bases (vs puff of air) test was done for glacoma (and once again, I failed, yeah me!) Plus, my retina was scanned with a lazer. The process took hours! Eventually, I got a new prescription for a pair of eye glasses, and along the way, I got about an inch of secret sock knit. Almost time for a heel. And that was it for the sock for the day. After the appointment, an nice walk.. It was yet another beautiful day. And the end of the walk, a few veggies from the market—and bread. I don't each much bread—When ever I buy bread, I immediately freeze half the loaf—and frequently find the remaining half has gone moldy before I finish. But Aldi's had a super sale on bread—it happens when they are overstocked. I passed on most of the bread—I just didn't need plain white bread—but a 6 pack of english muffins for 10Cents? Of course I bought some! I was tempted by the Kaiser rolls, too, but passed. But I didn't pass on the pineapple. Fresh pineapple is a wonderful indulgence—Fruit salad for breakfast in stead of my usual orange is festive too. Once home, I didn't do any work on the ski mask—All that black has worn me out. Instead, I did what I frequently do when stuck—I cast on. I have this silk—Oh, its beautiful-- 8 oz of hand painted luxury. I inherited in one of the SABLE's that came into my life—I was so shocked.. I wondered how anyone could have this silk and not have knit it up. 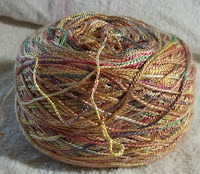 (I am beginning to learn how) It was a hank, and I had it made into a skein almost immediately. 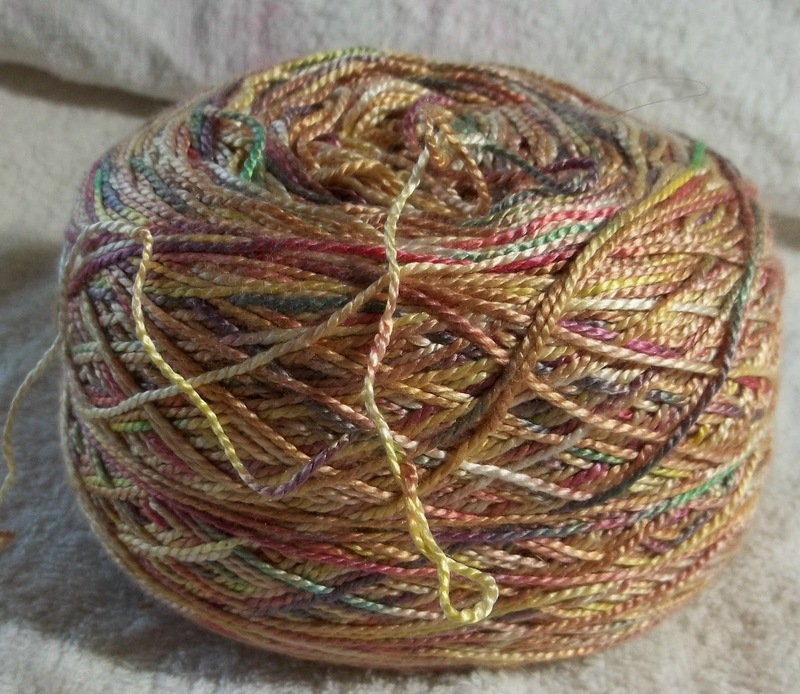 So far, I have tried out 3 different ideas for this silk, and nothing is right. This is the latest—the Summit Shawl/scarf from Knitty. But not this silk, in this pattern. Maybe if I made the ribbons wider, (and more of them) maybe if I make the gauge tighter..I LIKE the idea, but not the actual results I am getting. And there is no clear solution to exactly what is wrong. This bit of a scarf will be frogged, and some other idea will be tried out. This silk is mute about what it want to be, and truculent. It lets me knit it up, knowing full well, it's not the right thing. It rare that I am so stymied by a yarn. I love this silk, but I am beginning to understand how it ended up unknit in someone else's SABLE, beautiful, but not knit. That silk is gorgeous! How could anyone ever part with it? Lucky you! I made you picture of the Knitty Summit shawl big, and that is a very pretty Shawl! I'm going to go get that one. Thank you for sharing it. Your day out was very interesting, and I'm glad that your eyes are fairly tip top, glaucoma, or glasses, or no.